Representing the 9th Cavalry Buffalo Soldier, my name is Don Parish. My Buffalo Soldier unit is located in Lancaster, Texas which is twelve miles south of Dallas, TX. I always say pictures are worth a thousand words and by modeling for Kathy Morrow, I can say that I am the most photographed Buffalo Soldier in the United States and a few countries. 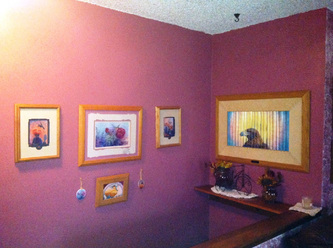 I own several of Kathy’s paintings, drawings and original painted ponies she designed for Trail of the Painted Ponies. 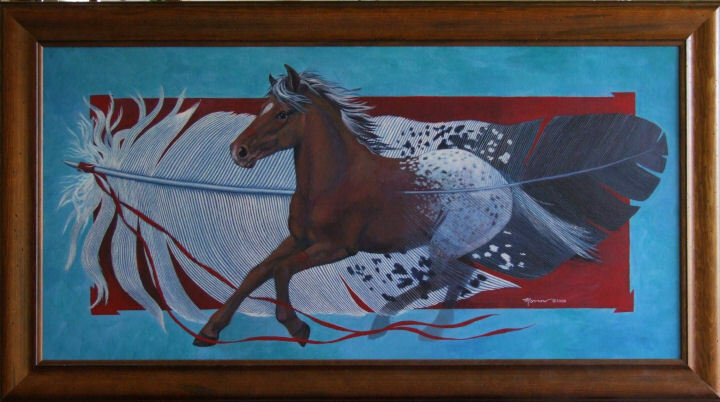 Tatanka Brothers is a kinetic painting that Kathy did as a commission for me. She also painted a pony for me with a similar theme called Tatanka Brothers Pony. I’m proud to be represented in another painting of hers titled Small Talk with Chief David Bald Eagle. My Arabian horse, Ghost is the model for her painting Ghost Dancing and she did him as an original pony in Buffalo Soldier Pony. Thanks to Kathy, I can look to the future and say "The Sky’s the limit !" I love this mural! I puzzled about it for weeks, Kathy asked what I loved and it was birds and flowers. I said I had always tried to grow a wisteria but settled for climbing roses and this idea formed in Kathy''s mind and I loved it. Thank you Kathy, for making it come to life! Tom would have been so proud of this work and you brought back so many memories of our times together photographing cherry blossoms in DC. I can’t tell you how pleased I am with your final result. I look at it and it is so beautiful that it brings tears to my eyes. Thank you for making my rotunda so beautiful and for bringing back many good memories of the time I had with my Tom - the love of my life. I wish I had more words to describe how happy (and sad that Tom isn't here with me to see this beautiful end project). Thank you,Kathy, for bringing my memories back to me. You had brought something into my home that will keep Tom with me always. I can never tell you how much that means or how beautiful your work is. 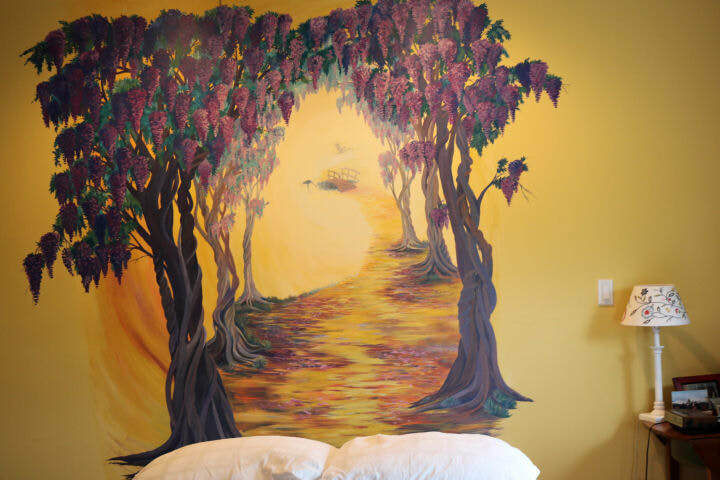 "Cherry Blossom Time" is a commissioned mural for Trish & Tom H home's Rotunda. I stood on two 6 ft scaffolds stacked together and on top of that a step ladder to help me reach to top of the 20 ft. wall. The home is decorated in three shades of grey. The 18 Cherry trees are three shades of grey in the same palate with pops of pink starting with a few colored blossoms among the grey tones at the bottom and then increasing in color at the top most branches. Two Orioles, Cardinals and Blue Birds are in full color among the tree branches both flying and perched. All the birds were painted in a limited palate of Red, Yellow, Blue, White and dark Grey. 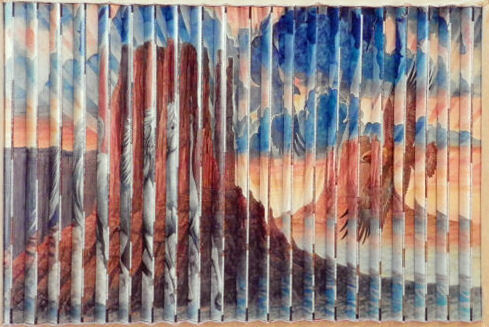 I loved the challenge of this work - mental, spiritual and physical. 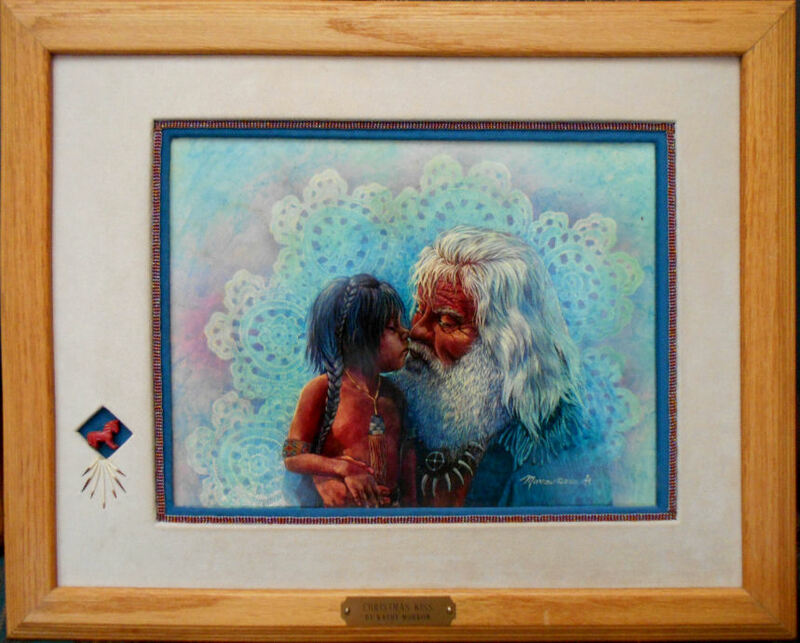 Jack J - Macomb, MI - "Christmas Kiss"
Gene & Connie - Las Cruces, NM - "Feather Dancer"
Rhonda and Lowery - San Antonio, TX - "Sunrise Riders"
We first saw Kathy’s work in 2006 at the annual art show in Ruidoso, NM and fell in love! 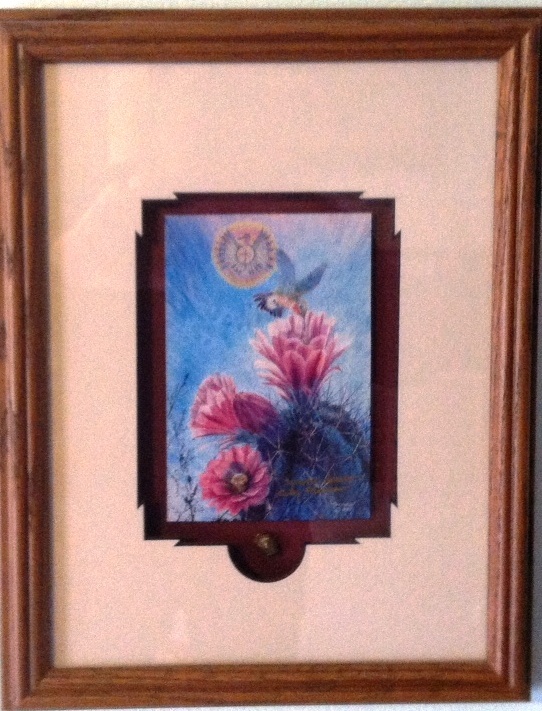 At the time we couldn't afford to purchase, but we started to save for a commissioned work. Unfortunately we did not get her card and couldn't even remember her name. 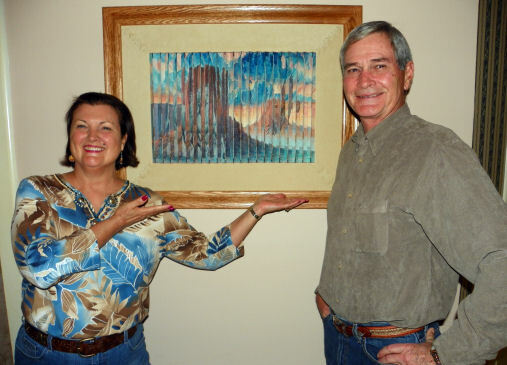 We faithfully attended the Ruidoso art show every year hoping to see Kathy and her work again. We finally saw her again in 2012 and jumped at the chance to talk with her about commissioning a work. Kathy is so easy to talk to and her artistic talent is phenomenal. We discussed our preferred subject matter and colors. Kathy’s ability to capture our desires and dreams was truly amazing. 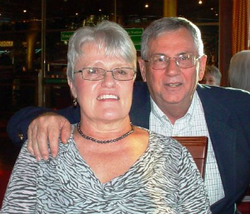 Kathy kept us informed and updated about every step of the project and continually requested our input on the progress. She posted and kept updated a YouTube video of the progress which allowed us to also share it with friends and family. Kathy went above and beyond by personally delivering our art to us. She even helped us hang it! Kathy is a delight to work with and is definitely on our short list of favorite artists! 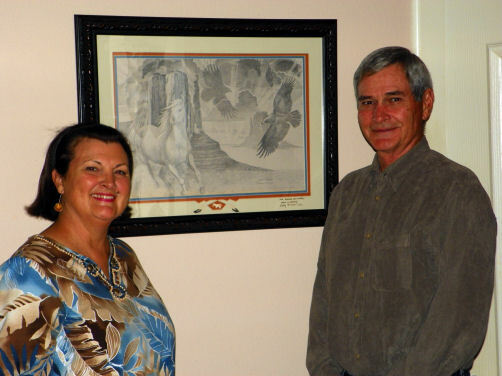 My wife Nancy and I started collecting the Painted Ponies, when we visited the Art fest in Cloudcroft. We went into Kathy’s booth and saw her signed ponies “Give Me Wings” and “High Desert Horse Feathers” and purchased them both. We also loved her paintings and prints. 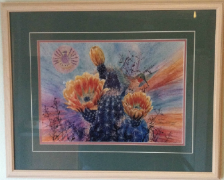 We saw Kathy at other shows in Cloudcroft and at Weems Art fest in Albuquerque and started purchasing some of her prints. We purchased one of her original ponies, “MOUNTAIN SPIRIT PONY”. We have since purchased two of her Original Paintings “Lord of the Dance” and “The Lady Or The Tiger”. The incredible detail and colors in all of her artwork is amazing. We now have her originals or prints in every room in the house. It is always wonderful to talk to her at any of her shows. 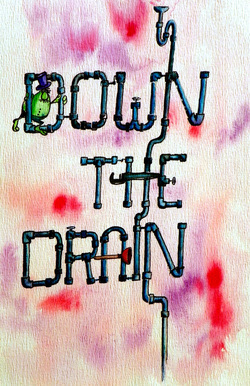 Down The Drain is a children's book that was written by Merle Slage and illustrated by Kathy Morrow. I wanted some of the kids that read it to give me their opinions about the book. Big brother Zachary is a real Neat-Nik and didn't care for dirty land but liked the Bubble Car. Little brother Zeric is just the opposite of his brother and loves getting dirty. Content copyright 2013. Kathy Morrow Studio. All rights reserved. Check back often and please bookmark us at Kathy Morrow Studio!